The Crucifixion & Resurrection preached each Sunday Morning in March. 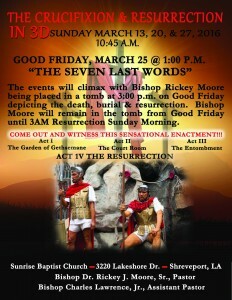 Good Friday March 25 at 1:00 p.m. “The Seven Last Words.” The events will climax with Bishop Moore depicting the burial and resurrection by being placed in a tomb on Good Friday, and will remain there until Resurrection Sunday morning. Click here for a live stream of this event!